I am by no means a coffee snob. My coffee habit costs me about $0.45/per day. I hate starbucks. 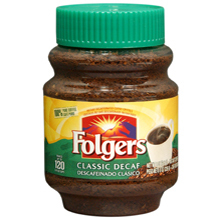 I typically drink Keurig K-Cup coffee in the morning, Green Mountain – flavored coffee is my favorite – but at night, at home, I have Folgers Decaf Instant coffee. Out of all the decaf coffees out there, this one has the lowest amount of caffeine (99.7% caffeine free) . And if you are as sensitive to caffeine as I am, even a sip of decaf tea will have you walking on the bedroom ceiling at 2am. Which is bad. A nice cozy cup of coffee to snuggle up to at night, very goood. you got the right idea. i guess we’re both really sensitive to caffeine. I’ve got this in my cupboard and i drink it at night while the hubby brews his strong cup o java. I can drink coffee along with him and not “walk the ceiling” at 2 am also! Love it.